Address: Franchy Roca, s/n, Caleta de Fuste (Fuerteventura), Islas Canarias. Set overlooking Caleta de Fuste Bay, Castillo San Jorge & Antigua is 500 metres from the town centre and Castillo Beach. It features outdoor pools and sports facilities. All bright apartments and studios at the Castillo San Jorge have satellite TV. Each has a kitchenette with a microwave and tea and coffee making facilities. The San Jorge is set over 2 buildings, each with a pool for adults and one for children. There are also several bars and the restaurant offers local and international options. 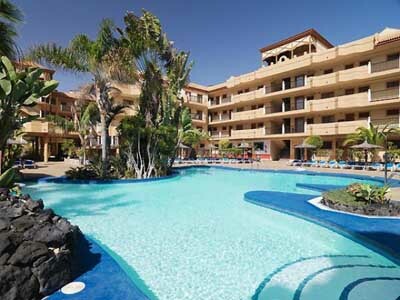 The Suite Hotel Castillo San Jorge & Antigua is just 6 km from Fuerteventura’s El Matorral Airport. Please note that reservations of 5 or more rooms may be subject to special conditions and extra charges. Please note that half board or full board rates do not include drinks. Children are considered as aged under 12 years.